Height 76cm, Width 48cm, Depth 14cm, weight about 30 Kg. 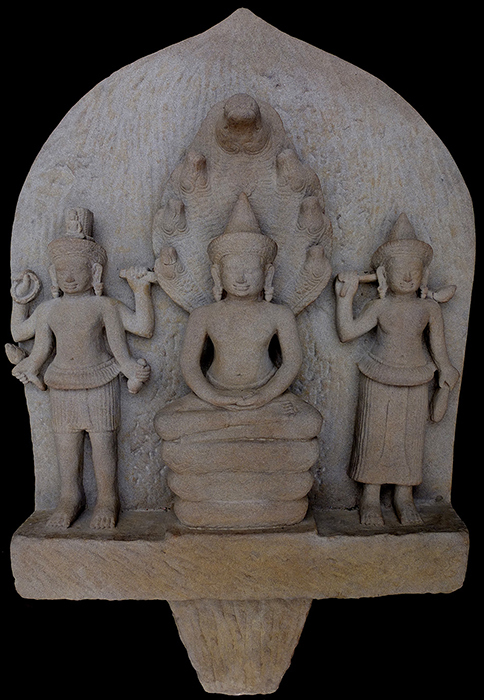 Description: The Buddha in the center is taller than his companions. His throne is formed by three coils of a Naga, which then rises behind his back, and spreading wide its hood with the seven heads to protect the Buddha. Avalokiteshvara, on his right, stands erect on a square base. Prajnaparamita is on the left of the Buddha. The Avalokiteshvara holds his attributes: the lotus bud, the beads, the palm-leaf manuscript, and the flask of the nectar of immortality. The Prajnaparamita holds her attributes: lotus buds in her hands.